This is one heck of a game considering it’s a movie tie in. Often these things feel really contrived and rushed and earlier Pixar based titles have been really lacklustre and not as inpiring as their onscreen counterparts. This game however has turned the scales on this impression and come together as a really fun game that you can enjoy regardless of if you saw the movie or not. 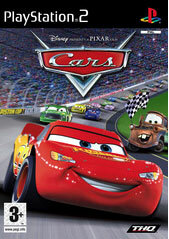 To quickly fill you in though, Cars is a movie about amazingly enough, Cars! But these ones are cute, talk and you will find yourself almost instantly endeared to them. You get to play the part of Lightning McQueen, the star of the movie and run missions around the city and world that you inhabit. Here there are no humans to crash cars, just the Cars themselves with their little faces and smiley mouths. In any case, Lightning has got a big race to prepare for and that is where you come into the whole shooting match. 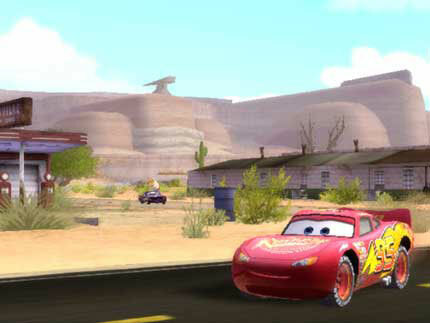 The town of Radiator Springs is a lively place filled with the fun and life that you experience in the movie. The main aim of the game is to race as much as possible to give Lightning the experience that he needs to race in bigger events. 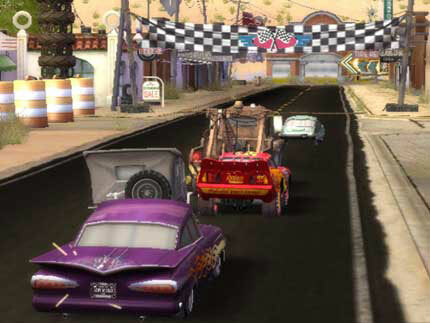 The way that you do race is an absolute joy and the feel of the title is very much like a supercar game, or more likely, the American NASCAR series due to the fact that its just lap after lap after lap. Graphically the title really looks like the movie and moves with a very nice smoothness. It appears as though a fair bit of effort has been put not only into making this game run as well as possible and there are a stack of neat touches to it that will make punters smile such as the inclusion of all the real voice actors taking part in the game. Fortunately, it seems that getting no name impersonators to do the in game audio is a thing of the past and I really hope that it continues to be this way. Occasionally you will hit small problems with the game such as there seems to be a collision/barrier systems with a few glitches in it that will see you hit a spot in the race and you just can’t make, like being caught in an invisible wall. It only happened once the whole time that I played this game but it still was weird when it happened and I had to restart the game. Just one of those things that I would be remiss not to mention, but also a thing that likely won’t happen to you. This is one of those titles that is going to bring a smile to your face, more than once. The games strength is in the fact that it’s a great game to play, lots of fun, there are a stack of mini games to discover that will make the whole thing shine and the fact that you can play with a friend will while away many a weekend! Give it a shot!